The acid-test or quick ratio is a variation of the current ratio that divides current assets by current liabilities to arrive at an answer. However, it is a stricter test of a company’s liquidity because it factors in to account only the most liquid assets that a company has including Cash, short term investments & accounts receivable. 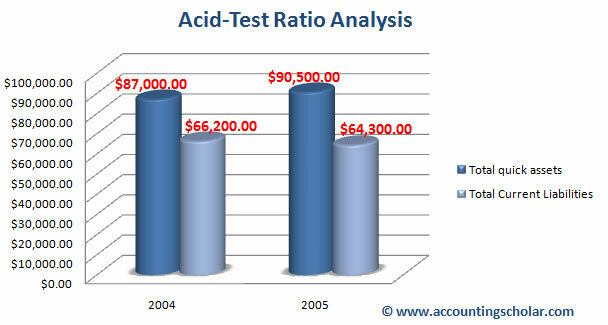 Inventory is not included in the acid-test ratio calculation because of the length of time needed to convert inventory to cash by making sales. However, there may be some types of inventories such as groceries, milk, eggs & meat that are more liquid than accounts receivable, however according to accounting standards; they may not be included in the acid-test ratio. Also, prepaid expenses are not included in the acid-test ratio because they cannot be converted in to cash and are not capable of covering current liabilities. Consider the following data for an imaginary company. We see that the company’s liquidity has increased from $1.31 in 2004 to $1.41 in 2005. This means the company has more liquid cash in 2005 than in 2004 which is certainly a good improvement. In 2005, the figure $1.41 means the company has $1.41 in liquid assets for every $1 it has in current liability. Usually analysts prefer to have a ratio of 2:1 meaning for every $1 of short term liability, the company has $2 in cash to be able to repay its liability obligations. The quick acid-test ratio is used by short term creditors to determine the deterioration or improvements in a company’s liquidity which indicates the company’s ability to meet its short term debt obligations and to be able to repay its debt maturing in the short term. Also, a lower quick ratio means the company will have greater difficulty in borrowing short term cash because banks know the company is cash strapped and has a high chance of not being able to repay its debts.